Vivienne Westwood shoes are iconic because of the way she designs footwear defying conventions, comfort, and even bordering to outrageous and fetish. Westwood has long been known as the quintessential designer who successfully introduced new wave and modern punk into mainstream fashion. Her footwear creations have remained controversial and very much in demand until today. 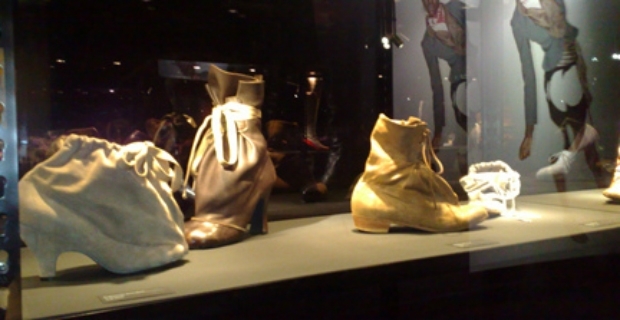 It was in 1981 when Vivienne Westwood designed and created the now famous Pirate Boots. The frenzy for this type of footwear began in 1999 when Kate Moss got herself a pair from Rellik, a vintage fashion store. These shoes are great for any outfit from skinny jeans to flowing dresses. They are still available for sale at Westwood stores in natural black leather and straps. Naomi Campbell falling over while wearing a nine-inch faux crocodile skin Westwood platforms is a famous and well-known image in the fashion world. Fortunately, Naomi was quite good-natured about it and she was even caught laughing when she fell. These shoes are now part of the Vivienne Westwood Shoes Exhibition which has travelled extensively across the globe. The Toile Print Boot created in 1996 drew its inspiration from the famous 16th Century blue and white Dutch pottery in Delft. In the same year, this pair of red and white boots is an example of ‘Victorian dandyism’. This stunning pair of 15.5-cm black stilettos with a strap and white borders is a clear tribute to fetishism. These slightly above ankle boots came out in 1999. Featuring shoe laces, camel and beige colours, it makes a striking combination reminiscent of the Sahara desert, but was also a portrayal of British colonialism in the continent. Released in 1986, the platform shoes became an instant hit and a collectible. The original pair was white in colour with strap fastenings. They remain popular to this day. 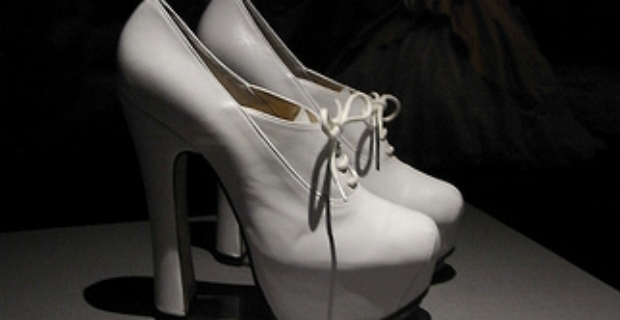 Vivienne Westwood shoes are simply fabulous, inspiring, and awesome. If you want unique shoes with character, soul and spirit, her footwear creations are great additions to any wardrobe for a strong fashion statement. These eye-catching and unique creations are truly original and distinct, signature marks of one of the most influential fashion designers of all times.